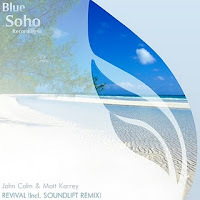 My 8 October 2010 Friday's Trance Track of the Week is Revival (SoundLift Remix) by new Polish duo Matt Karrey & John Calm which is available from Beatport. Click artwork (at left) for release description at DJ Tunes. Listen to the entire SoundLift Remix at You Tube. The track has been included in my October 2010 "Saints & Sinners" mix.